Lollapalooza Berlin has had a pretty tough time since it was first launched in 2015. And although this fourth edition at new home – the historic Olympiastadion – was by far and away the biggest success yet, it was not without its hiccups. That said, the eclectic lineup, impressive location and glorious weather proved that the future is most certainly bright for the German leg of this iconic US festival brand, first brought to life in 1991 by none other than Jane’s Addiction frontman Perry Farrell. After trialling the festival at three other locations – Tempelhof, Hoppegarten and Treptower Park – with mixed to negative returns, this year’s “Lolla” (as it’s affectionally known as) was the first attempt at the Olympiastadion, a grand complex with imposing towers situated around a giant stadium, commissioned by Hitler for the 1936 Olympic Games. The festival organisers deserve a shout-out for their use of the space, from housing the dance stage in inside the stadium (which they nearly pulled off, despite issues we’ll come onto later) and positioning the dual main stages in front of the iconic Bell Tower on the Maifeld, to use of the grounds, pools and unique placement of VIP areas, the layout was spectacular. Likewise with the facilities and entrances – queuing was kept to a relative minimum, especially when compared to the previous years. Here’s hoping Lolla has found it’s permanent home. In terms of music programming, this year bypassed the regular crop of rock headliners they are known for booking (Foo Fighters and Mumford & Sons last year, Kings of Leon and Radiohead the year before) in favour of acts and genres that would (mostly) connect greater with a younger audience. Bravo. After catching the end of synth-poppers Years & Years’ triumphant set on Main Stage 1, a show and production many considered to be the festival highlight, it was over to Main Stage 2 for Ben Howard’s dark and introspective set of indie-folk, layered with psychedelica, ambient and shoegaze. Musically, it was highly impressive: from Howard’s dexterity with his guitar to the full band backing him. However, eschewing his hits – including anything from his beloved debut album – in favour of experimental new material meant that the audience didn’t really engage. Unfortunate. Nonetheless, ‘Small Things’ was as spine-tingling as you’d hope. After heading into the stadium to the striking dance area – known as Perry’s Stage, of which only the stadium’s ground floor is used, leaving thousands of vacant seats staring down at you – to catch the colourful dance-pop of DJ-producer Jonas Blue, it was time to head back to the main stage for AAA favourites, The National. Although the band looked a little road-weary, Matt Berninger and co. were still the indie highlights of the weekend, knocking out a career-spanning set that included enough old favourites, as well as plenty of tracks of off last year’s excellent ‘Sleep Well Beast’. Highlights included crowdpleasers ‘Bloodbuzz Ohio’, ‘Slow Show’, a raucous ‘Day I Die’ and closer ‘Terrible Love’. Saturday night headliner, The Weeknd, drew an enormous crowd of young and old, and as the stage was set up anticipation grew and grew. And, for the most part, Abel Tesfaye delivered. The first time I saw him was in a little North London club called the Electric Ballroom, with zero production and little in the way of confidence, wherein he let his voice and music dominate the performance. That felt special. Tonight’s headline performance is the polar opposite, with visuals and pyrotechnics dominating the show, but it’s still special in different way. It’s great to see The Weeknd perform with such confidence and to such a massive crowd; there was always a charismatic entertainer hiding in the darkness. If he had stuck to the hits, tonight would’ve been a triumph, however after a strong start with ‘Pray For Me’ and ‘Startboy’, the next half an hour features too many fillers and covers, and it’s not until the midway point with the double-whammy of ‘Can’t Feel My Face’ and ‘I Feel It Coming’ that the show truly comes to life. Despite releasing an EP earlier this year, the setlist is heavy on Starboy, which is not necessarily a bad thing, but a few older cuts might have been welcome. That said, ‘Wicked Games’ remains an anthem as is delivered with immense power. Now, Saturday should have been closed out by EDM god David Guetta over at Perry’s Stage, inside the stadium. However, due to rather naive programming and organisation, the stage had to be closed down after reaching capacity. No one else was allowed to enter, including press and VIPs. As one might imagine, thousands of attendees were left disappointed and they didn’t hide their frustrations, many demanding refunds and questioning why they couldn’t use the seats of the stadium, of which there were literally thousands and thousands. In fact, the attendance of Lolla was approximately 70,000, while the capacity of the stadium, including the seats, is approximately 75,000. I put this down to teething problems and headed home, hoping – no, expecting – these issues to be solved by tomorrow. I guess it was my turn to be naive, but we’ll get to that later. Sunday was kicked off by my festival highlight, the woman of the moment, Dua Lipa. Pulling in arguably the biggest crowd of the whole weekend (no mean feat considering the early afternoon slot), Dua smashed out a pitch-perfect set of hits, led by her undeniable charisma and nifty little dance routines, all subtle poses, hip wiggles and high-kicks. The sound: amazing. Her voice: amazing. Her dancers: amazing. Her energy: amazing. In fact, being the last of her summer festival appearances, her energy was next level and she was clearly having a blast. I had gone to her set expecting attendees chilling, waiting for that song, but people were hooked from the get-go, and by the time ‘New Rules’ did come along, she had the crowd eating out of her hand. Pure bliss. After being pleasantly surprised by the following German hip-hop collective – the (apparently) legendary Freundeskreis – and their captivating blend of old school hip-hop, featuring the soulful sounds of guest vocalist Joy Denalane, it was time for Mr. Liam Gallagher. Having never seen Oasis, I was really looking forward to this set, but despite a few joyful pangs of nostalgia, I was left a little disappointed. Surprising, given that the bulk of his set consisted of Oasis classics. Unfortunately, Gallagher just did not connect with the audience, and his usual wit and charisma seemed to evade him. There were a few great moments, such as a stripped down version of ‘Champagne Supernova’ and closer ‘Live Forever’, but skipping ‘Wonderwall’ despite having performed it at nearly every show this year was misguided, especially given it’s the one Oasis song that really sold in Germany. The fact that the audience had halved by the time he had finished says everything. I had actually intended on skipping the next main stage act, Imagine Dragons, having never really been a fan, but to my surprise they actually put in one of THE performances of the weekend. A thrill from opening ‘Radioactive’ to closer ‘Believer’, Imagine Dragons totally won me over. Whether it was the Muse-level pop-rock pomp of the music, the massive production featuring confetti cannons and pyro, or frontman Dan Reynold’s incredible vocals and stage presence, the show was a joy to behold. Featuring more hits than I even realised they had (‘Whatever It Takes’, ‘Shots’, ‘Demon’ and, of course, ‘Thunder’), plus a touching dedication to Mac Miller (‘Rise Up’) and a moving speech by Reynolds about his own struggles with depression, including a powerful plea to never take ones life, Imagine Dragons totally hit it out of the park. Brilliant. Consider me a convert. Sunday night headliners Kraftwerk come armed with their legendary 3D visual show and arsenal of inventive, influential electronic works of art. It’s mind-blowing. They’re mind-blowing. There isn’t really much more to say, other than maybe they go over the heads of many in the relatively young audience, and perhaps some of the power of their live show is lost in an outdoor environment, but these are a minor details. In fact, most people attending Lolla are attempting the same impossible feat as last night: to enter the stadium to catch the dance headliner, which tonight is Kygo. And tonight, the festival organisers have had to call in the armed police to help them shut down the entrance to the stage. It’s a regrettable end to what has otherwise been an excellent day, as thousands of ticket-holders shout and cry in vain. 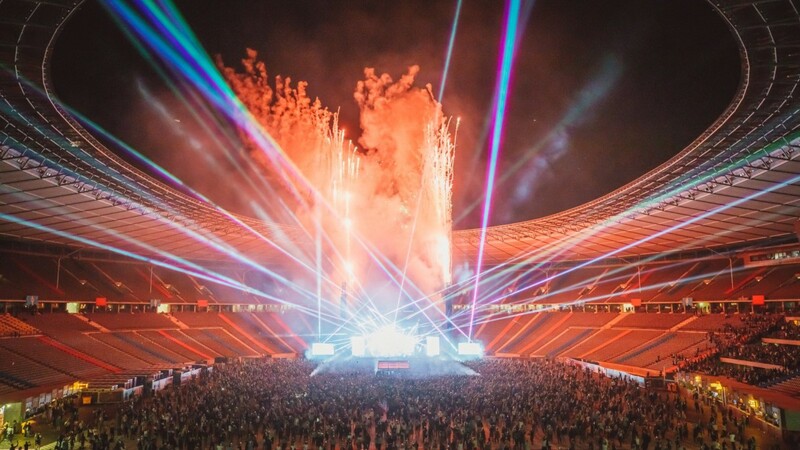 In booking international superstars like David Guetta and Kygo, and knowing the average age of the audience, you’d expect them to be given main stage slots outside, and it’s a real shame that so many people were not able to see their favourite acts of the weekend. All we can hope is that next year these issues are rectified, whether by opening up the stadium seats, or by moving artists of this calibre outside. For those that did see Kygo, he was as crowd-pleasing as you’d expect (if that sort of thing pleases you): a heady show of screens, lights, lasers, pyro and fireworks, all spicing up tropical EDM bangers. A fitting end to Lollapalooza 2018. So, all in all, an excellent weekend, though not one without its issues. Still, bring on next year!